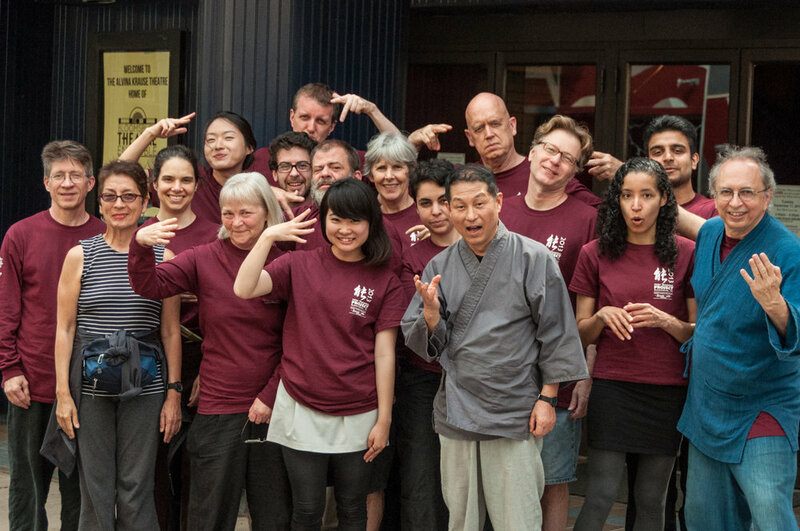 A two-week immersion in the development of mind/body awareness through daily training in the dance and chant of Japanese noh, meditation classes, and Alexander Technique. The ancient Japanese stage art of noh has much to teach contemporary theater artists, dancers, musicians, poets and others about the power of mind/body awareness both in their creative work and in their lives. Noh as Practice is a two-week workshop primarily focused on giving students an introduction to noh utai (chant) and shimai (dance) as traditionally practiced by the Kita School of noh. Basic instruction will be provided by senior members of Theatre Nohgaku, a troupe dedicated to creating new theater pieces in English using noh performance techniques. Master classes will be taught by professional Noh performer Kinue Oshima. The workshop will conclude with a student recital, with performers dressed in traditional montsuki (crested kimono) and hakama (divided skirts). To further hone concentration, amplify stage presence, and open new aesthetic vistas for creative work, Noh as Practice includes exercises in other disciplines including Alexander Technique and meditation. The Alexander Technique (AT) - AT is a psycho-physical re-education system developed by F.M. Alexander (1869-1955). Inspired by difficulties he experienced as an actor, his work evolved and its impact on personal habits and general health and well-being became evident to notable people of his time including John Dewey, George Bernard Shaw, Aldous Huxley and many others.. More recently AT has benefited from medical research confirming many of its beneficial effects, particularly with regards to chronic health issues like back pain. Still, AT is closely linked with theatre and Mr. Dubroff’s work focuses on the practical means it gives actors to address issues which may prevent them from using their primary instruments of body, voice, and mind, as effectively and expressively as possible. Elizabeth Dowd (Noh Instructor and Program Director) - Elizabeth began her study of noh in 1992 through a Creative Artist Fellowship from the Japan-U.S. Friendship Commission. That experience led her to co-found with Richard Emmert the Noh Training Project at the Bloomsburg Theatre Ensemble, where she served as Producing Director and faculty for twenty years. . A founding member of Theatre Nohgaku, Elizabeth has toured in TN productions of At The Hawk’s Well, Pine Barrens, Crazy Jane, Pagoda, Sumida River, and Blue Moon Over Memphis. She is the author of Gettysburg, an American Noh. Matthew Dubroff (Noh and Alexander Technique Instructor) - Matthew Dubroff has been studying and performing noh for more than 25 years. He has trained in Japan since 1990 with master actors and musicians for several years and got his M.F.A. in Asian Theatre Performance from the University of Hawai'i. The Japanese Ministry of Education granted him a Monbusho Scholarship for two years of training and research in Japan. He has been both a teacher and student of the Noh Training Project at BTE since 1999. He is a founding member of Theatre Nohgaku and performs with them on a regular basis. In 2018 he translated and directed the noh play Atsumori for a production at Hampden-Sydney College where he teaches theatre and is the Chair of the Department of Fine Arts. Dubroff is also a teacher of the Alexander Technique (AT). He has studied AT for over 30 years and trained at the Alexander Technique Training Centre in Charlottesville, Virginia where he became a certified teacher of AT in 2002. He is certified by the American Society for the Alexander Technique and currently serves on their national board. He has trained with teachers around the United States, In England, Israel and Japan. He teaches privately and in-group sessions around the world and focuses his work on AT within a theatrical context. Kinue Oshima (Noh Master Teacher) - Kinue Oshima is a professional shite-kata actor of the Kita-ryu (Kita School) and a member of Nohgaku Kyokai (union). She is a graduate of Tokyo University of Fine Arts and Music specializing in the instruments of noh. She began her career on stage at the age of two performing in the noh, Kuruma Tengu . She received her training from both her grandfather Hisami and father Masanobu. In 1998 she became a registered member of the Nohgaku Kyokai as the first female member of the Kita-ryu. In 2009 and 2011 she was the shite in the European and Asian tours of the English-language noh, Pagoda. In 2008 she was a noh chant and dance instructor at the University of Hawaii for their production of Sumida River in English and performed the shite role in English as part of the Where Rivers Meet tour organized by the University of the Incarnate Word in San Antonio, Texas. Assisting her father in 2001, she led classes in noh at the National Art Academy of Taiwan. She participated as a performer in tours to the Netherlands/Belgium, France, Bulgaria, and various Baltic nations in 2002. She was awarded the "Prefectural Culture Cultivation Prize" from the Kenshin Scholarship Culture Promoting Foundation in 2005. She is a Visiting Professor at Hijiyama University and a Part-time Lecturer at Hiroshima University, Elizabeth Music College, Fukuyama Women's College, Okayama San'yo Senior High School, and Okayama Sankun Elementary School. Jean Ann Wertz (Meditation Instructor) - Jean Ann Wertz's lifelong interest in Zen Buddhism eventually led her to Zen Mountain Monastery in Mount Tremper, NY, where she became a formal student in the Mountains and Rivers Order. She lived at the monastery as a full-time resident from 2011 through 2015, and more recently practiced for six months as a writer-in-residence at the Zen Center of New York City, the monastery’s branch temple. Jean Ann is a poet and an award-winning playwright. Her interest in noh began while studying for her MFA in Creative Writing at Goddard College, where her advisors included Deborah Brevoort (Blue Moon Over Memphis) and Kenny Fries (In the Province of the Gods). She was the recipient of a State of Connecticut Artistic Fellowship in Playwriting and has studied noh in Japan, Bloomsburg, PA, and other places . Program Fee and Payment Options $1200 ($1150 cash or check discount) includes housing, tuition, master classes, study material and dance fan. To reserve your place, please remit the full amount no later than May 31, 2019.